Emmanuel Church holds the distinction of being the oldest German-heritage congregation in Sandusky. By the 1840s, a large number of German immigrants had settled in the area and sufficient interest had developed among this group to explore the creation of a church. The official organization of Emmanuel occurred on July 7, 1844 at the Academy Building when twenty-two men met to begin planning for a new church. At another meeting held a week later a committee was established to create the church’s rules of order, which became Emmanuel’s first official board. Emmanuel’s first building was constructed from 1845-1846, about one year after the church was organized. This building was located along East Adams Street and served as the church’s home until the late 1850s, when the church was approached by the Sandusky City School district about acquiring the structure as part of its plans for a new high school building. 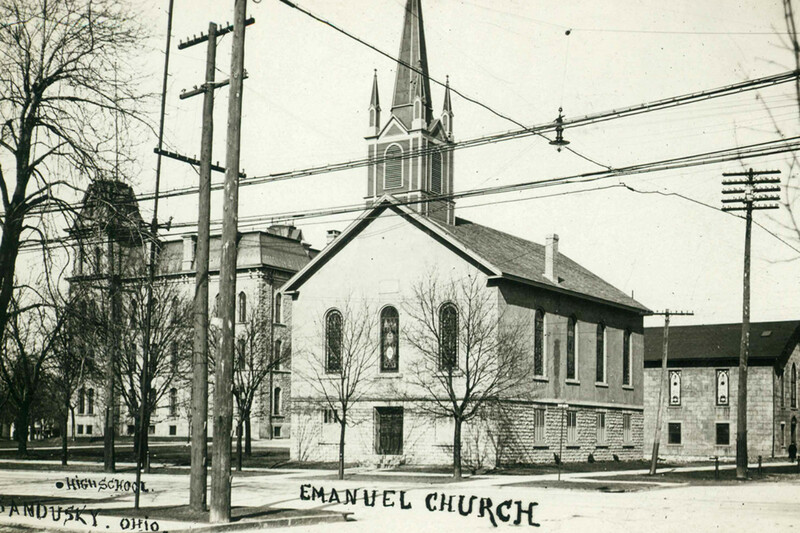 Under an agreement with the school district, Emmanuel sold the original church building for $3,200 and additionally was provided use of property at the corner of Columbus Avenue and Adams Street for a new church. It is at this corner where the present Emmanuel Church was constructed from 1866-1867. The original church building was later demolished. When viewing the exterior of Emmanuel, one should note the stained glass windows stretching around the building on the second floor, which are the originals from 1866. The addition on the north side of the building was constructed in 1958 in a $90,000 project that added classrooms and a fellowship hall to the existing sanctuary.